Every year in October board game fans from all over the world descent on Essen in Germany. 30 years ago the international gaming days were first held. It is the largest gaming fair in the world and in recent years well over 100.000 people come to Essen. I first went there in 2002, and have been there nearly every year. In 2003 Alex and I first saw WARMACHINE at the fair and spontaneously bought two starter sets. In 2004 and 2005 we helped out at the booth of Privateer Press. Essen is a yearly fixture on my calendar, even if I skipped a couple of them. This year I actually planned my visit a little more. In recent years I started to read a few comics, either on recommendation or because I got them as gifts. So I had a look before the fair to decide which comics I wanted to pursue. Parallel to the gaming fair ComicAction is held. Comic book authors and artists are there as well as a bunch of stores selling all kinds of comics. Unfortunately I wasn’t able to procure the top items on my list – namely the second volume of Kevin Smith’s run of Green Hornet and the second volume of The Shadow in Trade Paperback. 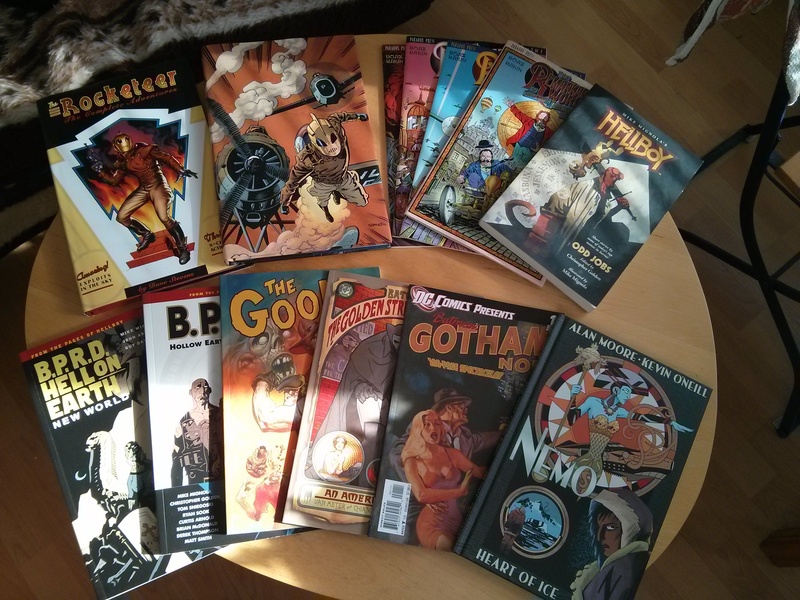 Yet I still managed to haul about 120€ worth of comics away from the fair.  2 books about the B.P.R.D. – the Bureau of Paranormal Research and Defense out of the Hellboy comics. 2 alternative Batman comics – out of the Elseworlds series of DC. Hellboy – Odd Jobs. A Short Story collection (and thus not technically a comic). Nemo – Heart of Ice by Alan Moore & Kevin O’Neill. And something called “The Remarkable Worlds of Professor Phineas B. Fuddle”. Of course I also went to Essen to look after stuff for my wargaming hobby. I didn’t need anything for my Trollblood army, but I finally decided to give my pulp gaming interests a go. Earlier this year I was made aware of www.pulpalley.com – which sold a ruleset for pulp gaming. I bought the rulebook and had a look. I also have a few minis lying around from an earlier try. Plus – I have a story in mind I want to play out on the table. But I needed gorillas for that. Of course the internet has nearly everything. So I found quite a few gorilla miniatures – but I waited to long. 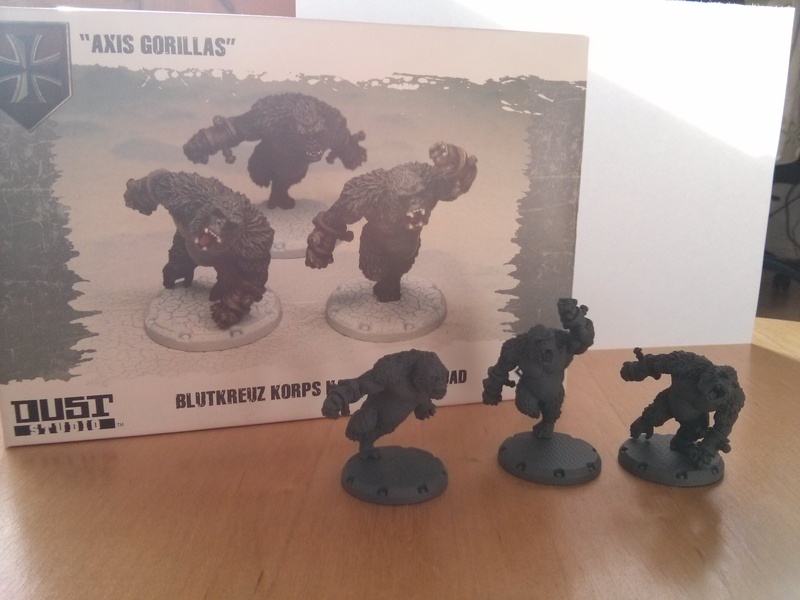 The German Altered Gorilla from Darkson Designs’ AE-WWII Game is nowhere to be found anymore. But Dust Tactics from Fantasy Flight Games had an alternative for me. That Kampfaffen Squad fits my needs perfectly and I found a box at Spiel. The bases are equivalent to a small base in Hordes – which would make them too small for Hordes, but are perfect for my pulp gaming. I will make a separate post for my Pulp Alley project. I also bought a few dice for that game. d8, d10, d12 – 5 of everyone as well as a box of d6. Every year there is a booth with used books. Horror, Sci-Fi, Fantasy. I always kinda ignored that booth – despite the fact that I am a huge book nerd. But I am also a snob of a sort. As I transitioned to english books over the years, I didn’t want to read the German translations. And since that booth mostly had German books of English authors I ignored it most of the time. But this year was different. I rifled through the books and found something – so I kept looking. The top 2 are dime novels from the 50s. Airship was that first book I found and which kept my looking. I had never bothered to really go inside the booth, so I never saw those boxes with old dime novels. 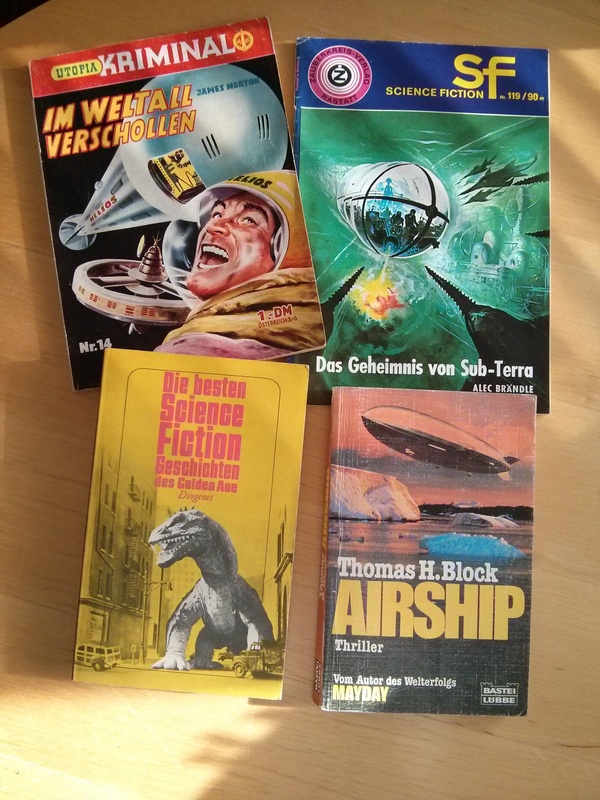 Mostly Perry Rhodan – but one or two boxes also had those Utopia novels. Since I know nothing about them I selected two that looked interesting. Can’t wait to read this stuff. Overall it was a very successful visit to this years fair. Incredibly exhausting, but very satisfying. You might ask yourself, why I don’t mention board games, since they are the main attraction of the fair. This is easily explained. I simply don’t have the time to take up board games as well. There were about a dozen games that interested me at the fair. “Fortune and Glory”. The 2 “The Adventurers” games. “Planet Steam”. And many more. Problem is – they aren’t cheap. Fortune&Glory sets you back 90€. Plus – with the wargaming and all the other stuff going on, I and my group simply won’t have the time to play stuff like that regularly. And I have the feeling that for some of those games I would be the only one interested in playing them. But other people are buying board games. In bulk it seems. Loads and loads of people were walking around with big bags or trolleys full of board games. Not only the latest releases and award winners, but also older games. There are many booths that sell old used games and people are flocking to those just as much as to the latest stuff. I will be back next year of course.